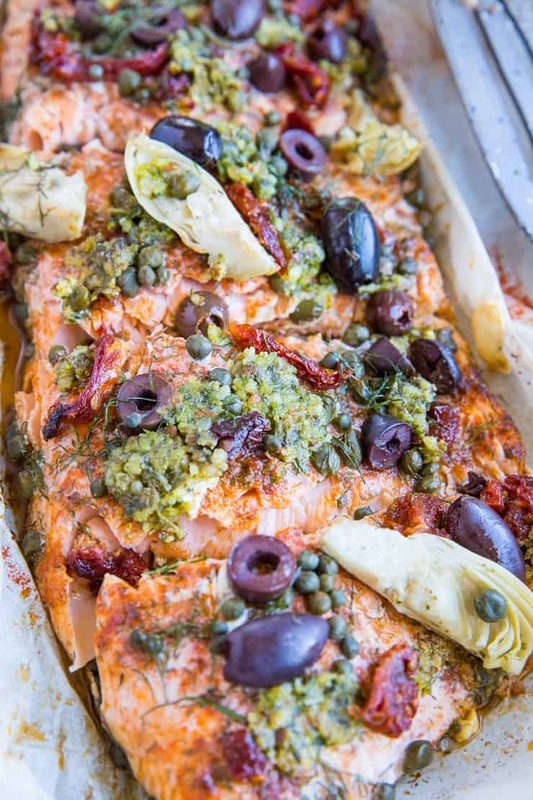 Mediterranean-inspired salmon in parchment paper with sun-dried tomatoes, dill, capers, artichoke hearts, kalamata olives, and pesto sauce is a mouth-watering experience for a lovely evening in. PLUS, it’s easy! Let’s do this! 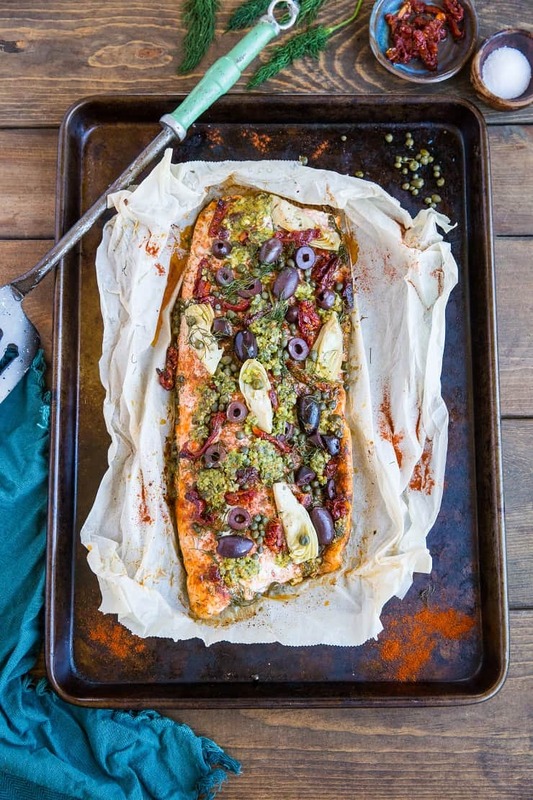 Have you ever made salmon in parchment paper (or fish en papillote, if you will)? Holy mackerel, it’s a treat! 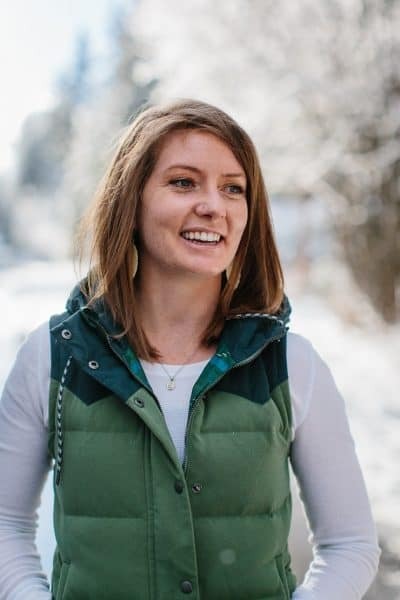 One of the astonishing facts I learned on my trip to Cordova, Alaska a couple years ago was 80% of the fish and seafood that is consumed in the U.S. is consumed at restaurants. Why? Because folks tend to be afraid of either preparing it improperly and getting sick, or preparing it in a way that isn’t palatable. Completely understandable. No one loves a parasite, and good seafood is pricy, so why risk messing it up and having the whole thing go to waste? While I understand the risk aversion, I’ve been wanting to dispel this fear ever since. Making fish and seafood at home is no more complicated than preparing any other form of protein, and we don’t have to save our seafood experience for the occasional special night out! While I have shown you The Only Grilled Salmon Recipe You’ll Ever Need , My Go-To Crispy Salmon Recipe (which involves broiling), and my Pan-Seared Salmon method, I have yet to show you how I prepare salmon in parchment paper — also known as fish en papillote. You guys, this is so dang easy. The reason I love cooking fish in parchment paper is you end up with this marvelously moist and beautifully textured result every dang time. AND THE FLAVOR…oh my gaaaaawww the flavor! 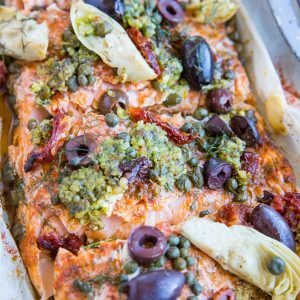 This particular recipe is chock full of big, bold Mediterranean-inspired ingredients, so you’re slated for that perfectly cooked salmon experience with all the flavor to back it up. 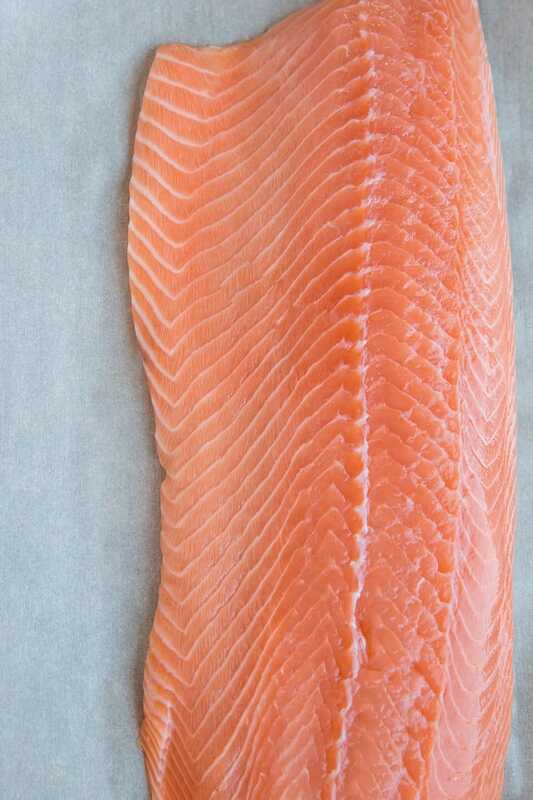 Procure a large salmon fillet (or any type of fish or seafood! Cod and halibut are amazing too!) – mine was 1.75 pounds. Simply lay a long sheet of parchment paper on top of a large baking sheet, then place the fillet on top. You can purchase smaller fillets, or cut the fillet into smaller pieces for individual portions, but I like making it in one big parchment paper packet to save time (and parchment paper). Season the fish with sea salt and your choice of spices. I went with paprika, dried dill, and ground ginger. Cumin, garlic powder, and onion powder are also great choices! After seasoning the fish, add whatever flavor-blaster ingredients you’d like on top. I went with sun-dried tomatoes, capers, fresh dill, artichoke hearts, kalamata olives, and pesto sauce (I used my homemade Low-FODMAP pesto https://www.theroastedroot.net/low-fodmap-pesto-sauce/ I showed you yesterday, but you can go with your favorite store-bought or homemade pesto). Once your ingredients are nestled on top of the fish, you’re going to wrap up the parchment paper to make it all nice and snuggly. The parchment paper will want to come apart, so I use three pieces of twine to keep it enclosed – one piece on either end and one for the middle. Now that we officially have our salmon en papillote, we simply bake it in the oven. I do 20 minutes at 400 degrees F. If you have a thicker piece of fish, you’ll be looking at the 25 to 30-minute time range to cook it all the way through. Cut the twine, un-wrap your papillote, and have yourself a glorious dinner! Now that the salmon is cooked, you can cut it into individual portions and serve with your favorite side dishes. I always love my Crowd-Pleasing Roasted Vegetables with salmon, but I’m thinking my Rosemary and Cumin Roasted Carrots, Spicy Kale Caesar Salad with Roasted Garlic , and Pesto Quinoa Salad with Asparagus, Avocado, and Kale would be marvelous pairings as well. I’ve been using this as a meal prep tool since salmon is one of my favorite sources of animal protein. I simply make a big fillet at the beginning of the week, store it in tupperware, and eat on it over the next 4 to 5 days. There she be, folks! Your newest obsession slash method for cooking your fillet o’ fish. The next time you meal prep or entertain guests, you’ll have this fool-proof method at your disposal! 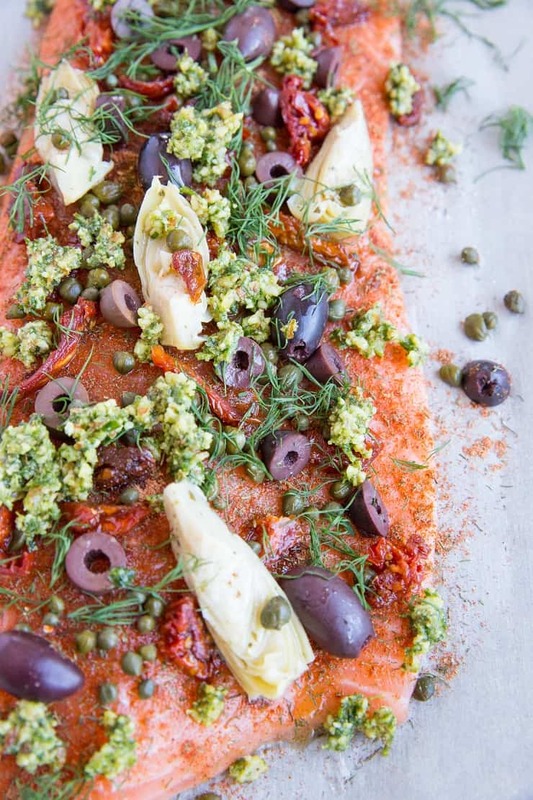 If you make this Mediterranean Salmon, please feel free to share a photo and tag @TheRoastedRoot on Instagram! 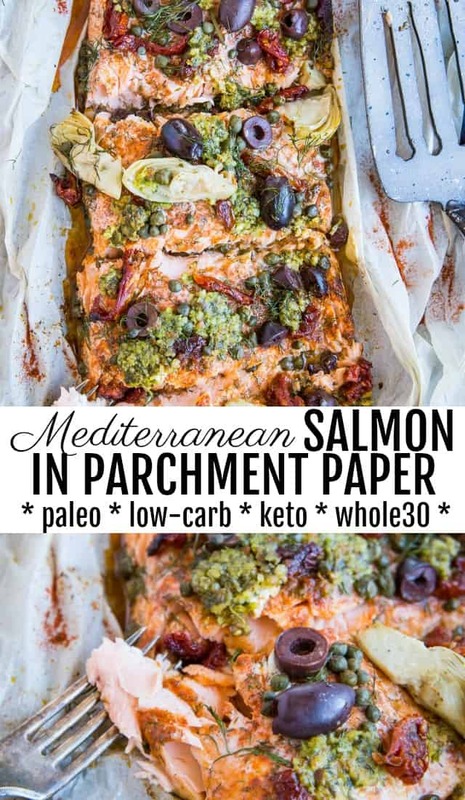 Low-carb Mediterranean Salmon in Parchment Paper is an easy, flavorful dinner recipe perfect for those who eat paleo, keto, or simply love clean meals. Preheat the oven to 400 degrees F and lay a long sheet of parchment paper on a large baking sheet. 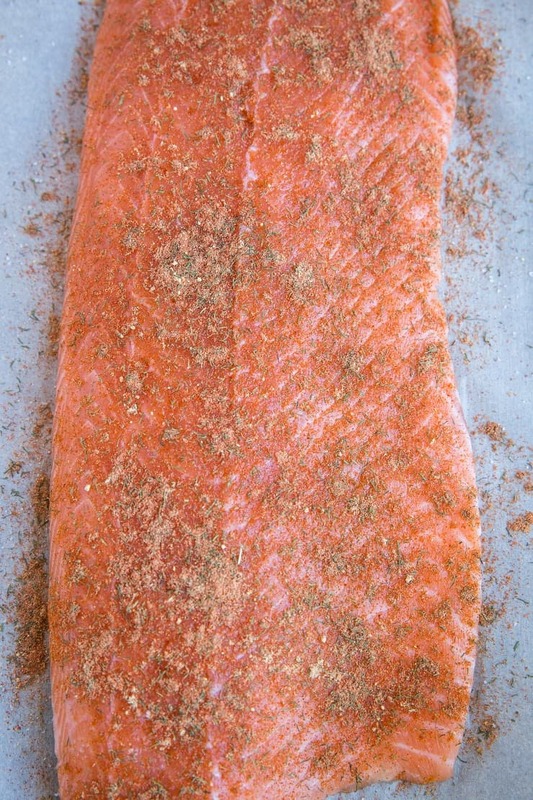 Place salmon fillet on top of the parchment paper and sprinkle with sea salt, paprika, ground ginger, and dried dill. Top salmon with the remaining ingredients, trying to get an even distribution over the full fillet. Fold the sides and ends of the parchment paper, creating a packet. Secure with twine. Bake on the center rack of the preheated oven for 20 minutes, or until salmon is cooked through. Thicker cuts of fish will require 25 to 30 minutes. 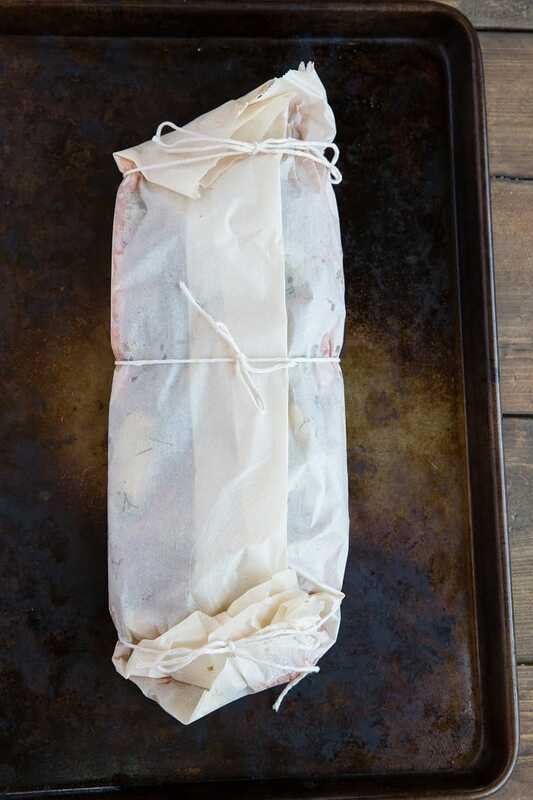 Remove fish from the oven, cut the twine and un-wrap the parchment paper. Cut into individual-size portions and serve with your choice of side dishes. Me parece espectacular la receta !! Muchas gracias. haha yup that was totally me – I refused to cook fish at home for so long! With no really good reason either lol ANYWAY now that I got past that … it’s time to try this salmon! It sounds delicious! I made this! So amzingly awesome! I used real sockeye salmon. So worth it! Thank you! My daughter made this for us: she made a parchment “boat” that was open on top and left off the pesto. This dish was one of the best recipes I’ve ever tasted for oven cooked salmon! We are making it tonight at another daughters and will follow the recipe more precisely just to compare (although leave out the pesto for those of us who don’t tolerate cheese)! 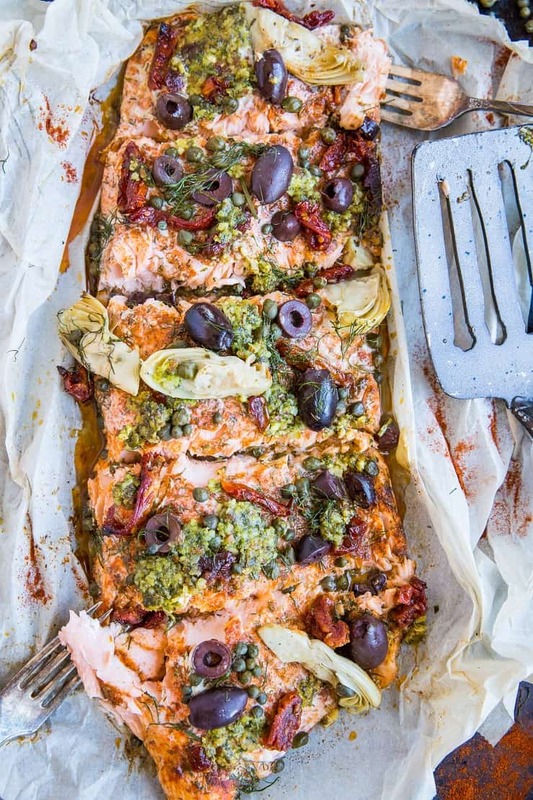 Thank you for this wonderful way to bake salmon! Followed the directions except for salt. Absolutely amazing. 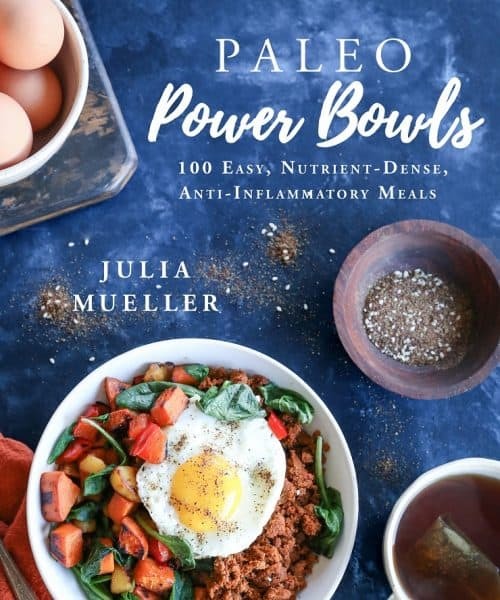 This is delicious, Julia! Love the flavor combinations, and it looks great too!! Interesting that you cooked it at 400F and didn’t get protein oozing out. I find that cooking salmon at about 325F works best, but that’s my experience. I cook salmon at least twice a month in a variety of ways. I’ll try this with more Mediterranean spices. How far in advance can you assemble this dish before cooking? It looks amazing! This was so delicious! So easy to make for a big crowd and incredibly flavorful. I cook fish all the time and loved the spice combination in this – it is very different and helped me beat the boredom of what I normally do with salmon. Highly recommend this recipe! This was delicious! As good as any fish served in a restaurant.